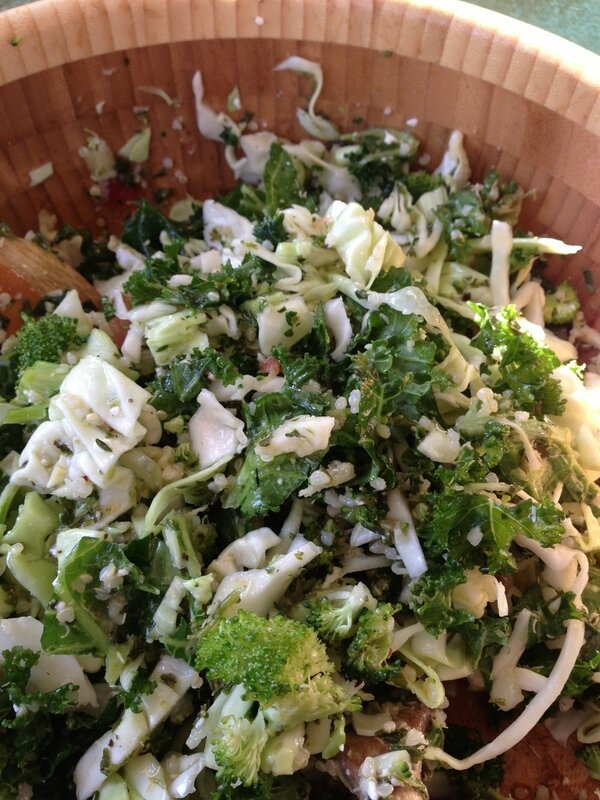 This is a kale salad, rich in vitamins and especially calcium. It’s so delicious I urge you to make this at home. The trick to a kale salad is to dress it about an hour before you serve it. This helps to soften the kale. These are the vegetables I had on hand. You can use whatever you have. 1 bunch curly kale, finely minced, or just cut it into really small pieces. Mix all together and pour over the kale. Let stand at least one hour before serving. I bought some fantastic sweet juicy peaches the other day. They inspired me to make this salad. For a basic vinegerette, use 1 tablespoon apple cider vinegar to 3 tablespoons good quality olive oil. 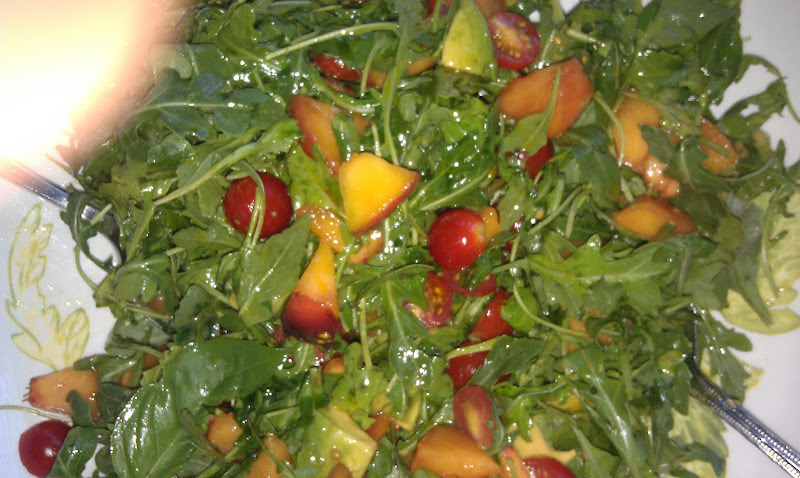 You can use less oil buy adding some fresh peach juice , or orange juice. It is summer and the vegetables at the farmers market are plentiful. I’ve tried to get more creative with my salads. 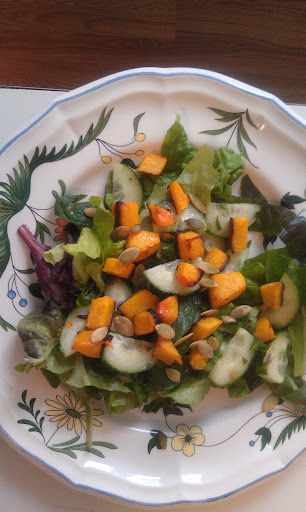 I know I post a lot of salads on my blog, but living alkaline, salads are a mainstay of our diet. We should be eating them every day. So try this one. I hope you like it. A combination of red leaf lettuce, and fresh spinach. Carrots, using a vegetable peeler to make the ribbons. Place 2 cups of dried garbanzo beans in a large bowl. Pour a generous amount of water over the beans. Cover with plastic wrap and set aside for 6 to 12 hours. Drain the beans and place in a pot. Add fresh water to cover, 1 carrot, 2 stocks of celery, ½ of a onion. Bring to a boil, reduce heat to a simmer and cook for 50 minutes - 1hour. Taste to determine doneness. Drain the beans. They are now ready to use. I always keep a container in my freezer. Note: Do not salt the garbanzo beans until they have finished cooking. If you add salt during the cooking the beans will harden. 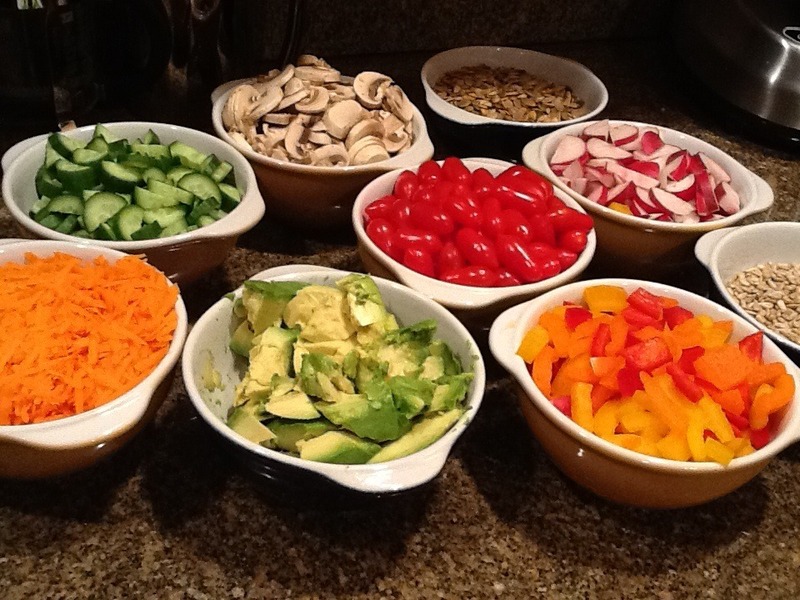 Create your own salad bar, invite your friends over and wow them. It’s just a fun way to serve a salad. Just be creative and place your favorite salad components into bowls. I used, grated carrots, cucumbers, mushrooms, radishes, avocado, red and orange bell peppers, tomatoes, chopped celery, toasted sunflower seeds and toasted pumpkin seeds. Serve with a big bowl of your favorite greens. My friend Lisa sent me this picture last night. I was so happy to receive this and to know that my alkaline lifestyle is rubbing off on my fiends. So I thought I would post it and share this delicious salad with you. Eating alkaline does not have to be boring. Not only is this salad beautiful to look at, it’s a crowd pleaser with great bursts of flavor in every bite. Don’t worry about the amount of ingredients, just use what you have to make a nice combination. I have given you an idea of what to go on. Serves 2. Easy to double this recipe. This makes a nice lunch or dinner. It is very easy to put together. Dress with a ratio of 1 tablespoon of apple cider vinegar to 3 tablespoons of olive oil. Mix together. To cook the chicken, preheat oven at 400 degrees. Line a baking dish with tin foil. Season the chicken with salt and pepper. Pace on tin foil and roast for 40 minutes. Remove from oven, cover and let rest for 15 minutes. Remove skin, the bone . Slice the chicken. Place on top of the salad. This is a composed salad that makes a great lunch or side dish. Slice and dice up the vegetables. Arrange on a plate. Dress with a little Olive Oil and Tangerine juice. I went to a friends house and this salad was served. Here is how we can make it more alkaline. Dress with the juice of one lemon mixed with 3 tablespoons of olive oil. This is a very simple salad that is easy to make and is very refreshing. If you are making a larger portion, the recipe for the dressing is in the Note section following this recipe. Right now the radishes are fantastic. 6 large radishes sliced as thin as you can. Chop fresh parsley approx ¼ cup. 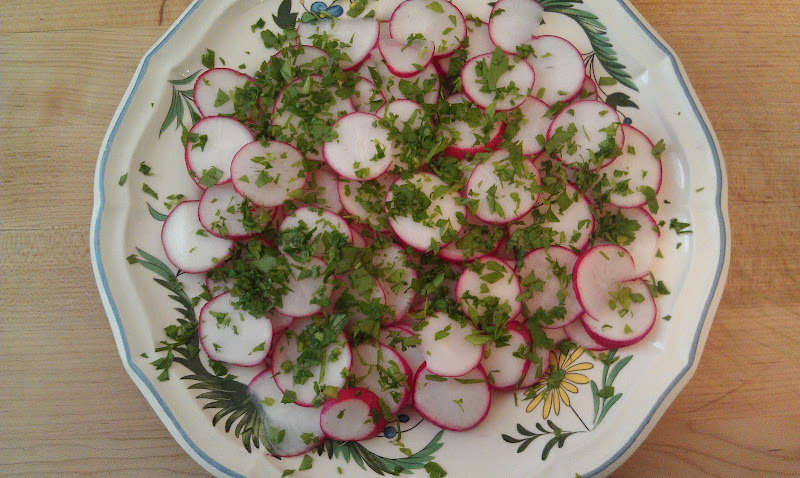 Place the radishes on a plater, sprinkle the parsley on top. Note, I like the ratio of 3 Tbsp oil to 1 Tbsp vinegar. This is a delicious side salad that I make all the time. 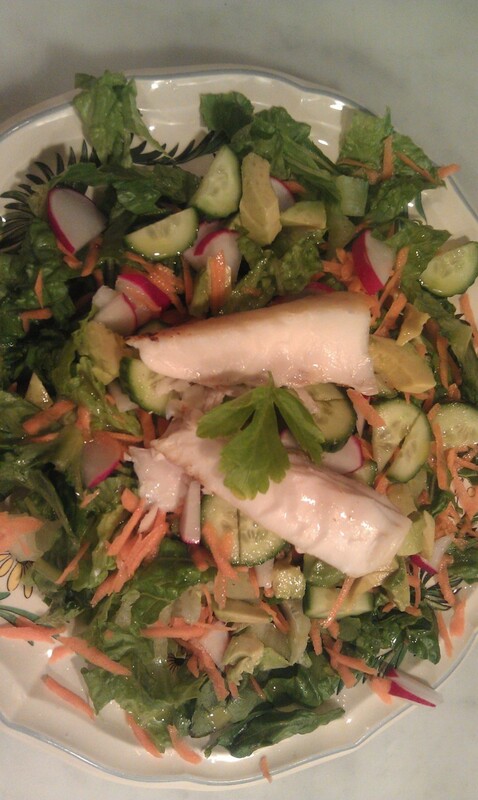 Delicious fresh greens from your farmer’s market with lots of celery, grated carrots and radishes. A favorite around my home. Dress with a simple mixture of fresh lemon juice and olive oil. It is a very refreshing salad. I like to sprinkle parsley over the top. I started making this as a soup, but it came out so thick I decided to call it a stew. If you prefer soup, just add more stock. 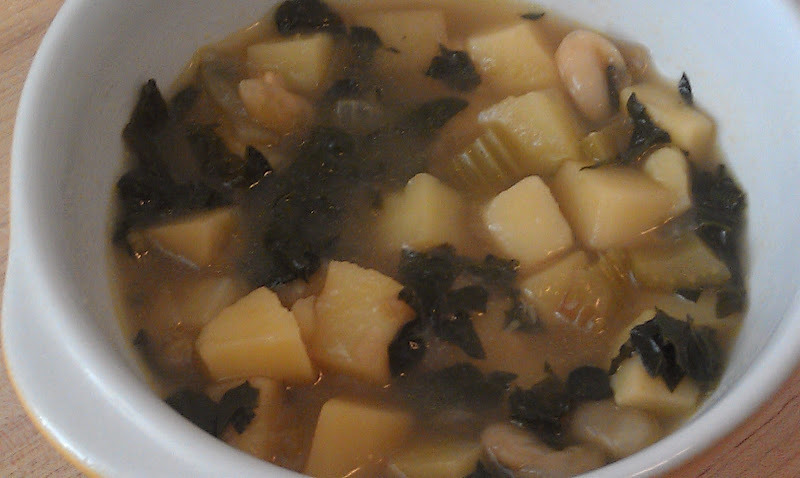 If you like stew, serve this over some Quinoa for a delicious alkaline meal. I know I post a lot of soups, they are my go to snack or meal that I have on hand. This is the key to staying on an alkaline diet. I always have a pot of soup filled with alkaline greens in my refrigerator. It makes it so easy to stay alkaline. I hope you enjoy this. Heat a medium size pot and add the olive oil. Add the chopped onion and celery. Cook for 5 minutes or until the vegetables have softened. Add the potatoes, kale and beans. Stir and season. Bring to a boil and lower flame to simmer for 45 minutes. This is a very thick and hearty soup. I like to sprinkle some chopped parsley over the top before I serve it. 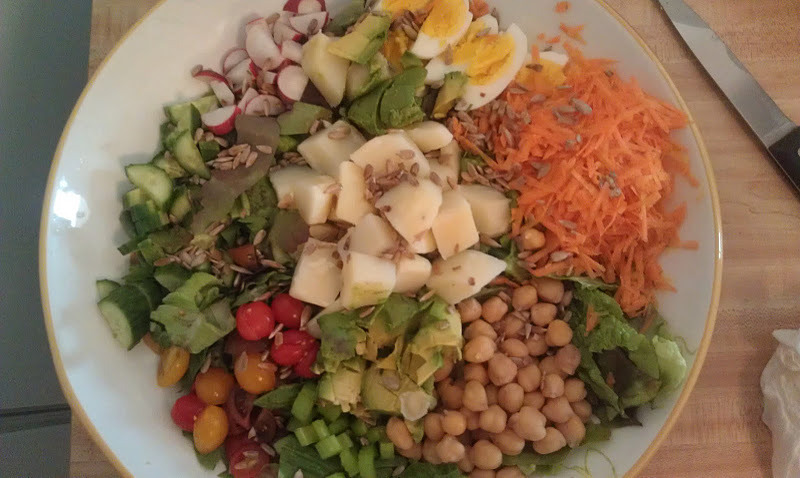 This is a salad that I put together rather quickly one day when a friend stopped by for lunch. I used what I had on hand. Feel free to use what you have in your fridge. Be creative. Here is what I did. ¼ cup toasted sunflower seeds. On a large platter, toss the parsley with the lettuce. Place each of the ingredients on top of the lettuce to create a composed salad. I like to separate the colors like I did on this salad. Notice the carrots are on the opposite side of the tomatoes and radishes, then I filled in with the cucumber, celery,eggs and garbanzo beans. I put the avocado and the potato on top. Be creative, every time I make this salad, it comes out a little different. drizzle in the oil and stir until you have a nice thick sauce. I served the dressing on the side. Bring Fall into your salad by adding roasted butternut squash. It adds a wonderful natural sweetness and a beautiful color. ½ of a small butternut squash, diced and roasted at 325 degrees for 20 minutes. Arrange the lettuce on a platter , sprinkle with the parsley. Add the cucumber and squash. Sprinkle with the pumpkin seeds. Mix together the citrus juice and olive oil. Pour over the salad and toss. This is a very easy but beautiful presentation. Note: If you are using tangerines, add a few segments to the salad for a little extra flavor punch. 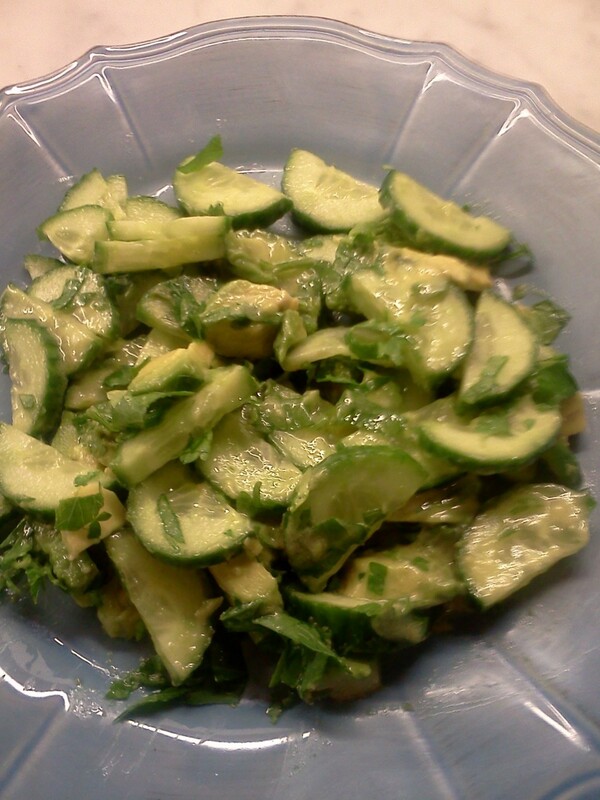 This is another version of my zucchini salad with almonds. Grate the zucchini using a food processor or by hand. Mix the lemon juice and the olive oil and pour over the zucchini. Season. Pour onto a platter and sprinkle the toasted almonds on top. You don’t have to have any lettuce to create a wonderful crunchy salad. I made it today and it was so refreshing to eat. You can use whatever vegetables you have on hand, just chop them up and you have a salad. It is a huge dose of alkaline vegetables. This is about a 90%-10% alkaline to acid meal. Thinly slice all of the vegetables, chop the green onions and parsley. Cube the avocado and mix everything else together to create this scrumptious chopped vegetable salad. This is a simple green butter lettuce salad with some sliced celery, radishes and fresh parsley. I made a hard boiled egg. (I only boil mine for 7 minutes) This was my lunch. I needed some protein. I know you might think that eating an egg is not alkaline, but in all my research, I can’t decide which part of the egg is acidic. Some sources say the yolk is the alkaline part, others say it is the white. But being on an alkaline diet does not mean that you have to give up the foods you love. Besides, eggs are very good for us and they do not affect our cholesterol in a bad way if eaten in moderation. And remember that if you are going to eat something acidic, just pair it with alkaline foods and you should be okay with maintaining this way of life. This is another salad entree. Good for lunch or dinner. I simply made a green salad of what I had in my refrigerator. This time it was some cucumber, parsley, celery, radishes, and some grated carrot. Then I topped it off with some delicious fresh Halibut that I just put under the broiler for about 12 minutes with a little bit of clarified butter, and the juice of 1 lemon. A 4 ounce portion of fish for a women and a 6 ounce portion for a man is the right ratio for an acid food mixed with an alkaline salad. Especially because I served this with my roast potatoes. Mix together and pour over the salad. Enjoy, this is really cool and soothing. 2-3 cooked Beets, depending on size. 2 Tbsp of grapefruit juice. Peel and segment the grapefruit. Squeeze 2 Tbsp. of the juice out of the membrane and reserve. Mix the beets, grapefruit and avocado together. Stir in dressing. Chop up all of the vegetables. Try to keep them roughly all the same size. Toss with the dressing, season with a little sea salt and pepper.